Create awesome Facebook banners for your advertising campaigns within minutes. Use our free banner maker and build your own custom banner ads, or start from one of our templates. Design Facebook covers, posts, banner ads and much more with our free online editor. With over 4,000 social media layouts available, you have lots of banner templates to choose from. Pick the design that's right for you, adjust it to your liking and you’re good to go. Your Facebook page has never looked so fresh and original. Create Facebook covers, posts, banner ads and more, that turn into likes and shares. Use Bannersnack as your very own Facebook cover maker and create a great looking timeline cover. Start from one of our many cover templates. Create image banners for your Facebook campaigns using our banner creator, grab the attention of your target audience and increase your conversions. A dull event cover will make visitors less likely to participate. Create a cool event cover that will make everyone join up. Stand out and switch from ordinary to extraordinary. Earn more likes by using GIFs or MP4 files as your Facebook cover. 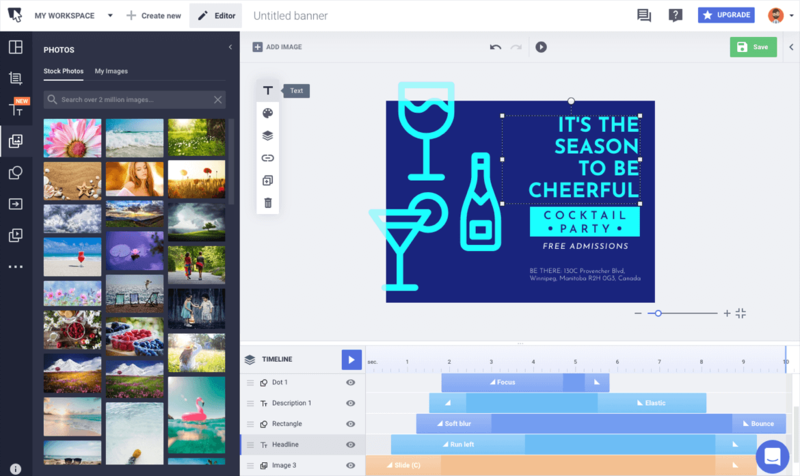 Generate engagement by adding SVGs in your banners. Hassle-free, of course! Keeping your Facebook page fresh and up to date has never been so easy! Take advantage of all our features. Save time & money while improving your performance. Yes! It is as easy as it sounds! Make your images look outstanding with our professional stock photos. You have up to a million options! Don't forget about your copy! We have the coolest fonts and some great typography presets, created just for you. Personalize your ad, cover or post with your own images, fonts & effects, and make your banners fit your own style. Once using our free Facebook banner maker, you don't have to worry about sizes anymore. We've got them all ready-made for you! Improve your efficiency and workflow by taking advantage of all features, preset layouts, responsive graphics, ready-made sizes and more. Boost your social media income while staying on budget. Use our free online tool and don't waste more money on outsourcing. Open Bannersnack. Log into your account and hit Create New. Select the Facebook banner sizes according to your preference. Pick from one of our carefully crafted Facebook banner templates, or start from scratch. Upload your visual assets & texts and adjust them in our easy-to-use editor. Once thrilled with the final product, save it and download it. Share it on your social media account right away, or keep it for future occasions. There are many ways in which you can use our Facebook image maker. Use it for FB timeline covers, post images, event covers or even thumbnail images. You can also use it for other social media outlets.